Electric Heaters for Commercial and Industrial use are usually radiant heating that are silent in operation and do not omit any air pollution. 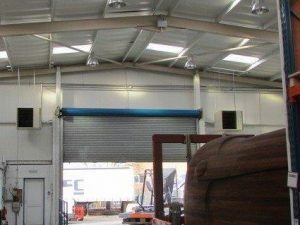 This Form of heating is ideal for buildings that are used intermittently, or where the building is large but the occupancy is low or occasional. Electric heating can be beneficial if a small area needs heating in a large building and the occupants are affected by doors being opened. Some buildings such as gymnasiums, churches, factories and aircraft hangars are notoriously difficult to heat. 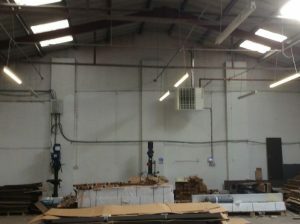 They can have high ceilings, poor insulation and roller doors constantly opening, letting the heat escape. Electric heating comes as either Ceramic Plaque heaters or Quartz infrared heaters, Radiant heated Panels and no light/glow radiant heaters. 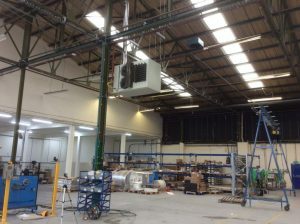 Some forms of electric space heating, boasts benefits such as low running costs, a range of bracketry as well as the space heaters being compatible with energy saving controllers. Electric heaters can be wall hung, chain hung and some can even be recessed into the wall. Quartz heating is a type of radiant heating using short wave infrared heating to heat surfaces & objects in the same way as the sun heats people & objects. Quartz heaters use highly polished reflectors to reflect the heat from Tungsten Halogen Bulbs to where it is needed and can be directed a specific area like spotlights. The bulbs also create a feeling of warmth by their Glow. Quartz heaters are suitable for indoor or outdoor use as they are not affected by wind or air conditions and due to their heat intensity they are highly effective for space heating. Quartz short wave heaters emit about 92% of its energy as heat and with no pre-heating time, the short wave heaters are the most energy efficient type of heaters. Some area such as food processing areas, schools, studios or conservatories need heating without light and Ceramic elements provide the perfect solution. In areas where more heat is required but less light there are a range of Ultra low Glare heaters that enable a soft glow while heating specific places. Multiple quartz heaters can be configured together to heat large spaces and hard to heat areas. This form of heating use infrared energy and have no visible light when in use, they do not deplete oxygen levels and therefore prevent feelings of drowsiness. Infrared Heating panels can be wall mounted or a perfect solution if you have a suspended ceiling as the panels become part of the ceiling while still radiating heat to lower levels. In offices Radiant heaters can be installed under desks to avoid the use of convection heaters which dry the air .